Just a mild request to people that use fanfare. If you are linking to a notable review in the body of your post, or in a comment you make, please use the 'Notable Reviews' feature. I've been adding them for a few movies where I see people making these external links, but I imagine that some folks didn't notice that this feature exists. This feature exists for TV episodes as well as for movies. Can you explain what this is? I wasn't familiar with notable reviews and a quick look at fanfare was not illuminating. If you look on the right hand side of this movie (Spotlight), underneath 'tags', you'll see the section (with some that I added from the post). Anyone can add movie reviews to a movie, you don't have to be the original poster (thanks for this feature, mods). Would "notable reviews" also include links to RottenTomatoes and IMDB (though I guess this isn't specifically a "review" as much as it is an aggregate), or would this be more for well-written... Vanity Fair or the AV Club articles? RottenTomatoes doesn't have full reviews, merely snippets of them; so I would say that isn't a 'notable review'. Movies already have an IMDB page near the upper right of the page. So IMDB would be redundant, and I'd personally vote against rottentomatoes (which I use plenty myself). But that's my own personal opinion. I don't mean to thread-sit. Doesn't look like this is accessible in the mobile view, I can't see anything that you're talking about in that Spotlight thread. Also, I'm not entirely sold on the concept since new reviews/articles that are posted as comments will show up in recent activity for those following the thread but additions to the notable review section probably(?) won't. dogwalker, if you scroll down to the bottom of the mobile page (or hit the skip button at the top, to jump there) you can see the sidebar content there, including the Notable Reviews section. hmmm still don't see it or any of the tags, just the regular site menu and fanfare specific sections (Fanfare talk, Clubs, My Fanfare). I may have it turned off in my settings though. Also on mobile, I can see the notable reviews but they're not highlighted or styled, it just looks like part of the post. There are a couple of things causing confusion here. First, in the example post that el io shared, the OP added a "notable reviews" section to the end of their post. That's not standard and it's not built into the site in any way. It was something that Sheydem-tants chose to include at the end of their post. Another thing confusing this situation is that people using the Classic theme on mobile will not see the sidebar "Notable Reviews" section—just like they don't see tags anywhere on the page either. People in the Modern theme do see these things at the end of the page. (It's one of the reasons we built the Modern theme. We wanted the mobile view and the Desktop view to be as similar as possible and we felt it wasn't possible with the Classic mobile theme.) Folks viewing with Classic themes on mobile can click "Standard Site" at the bottom of the page to see the Desktop view on their phone which will show them page sidebars including the Notable Reviews section. 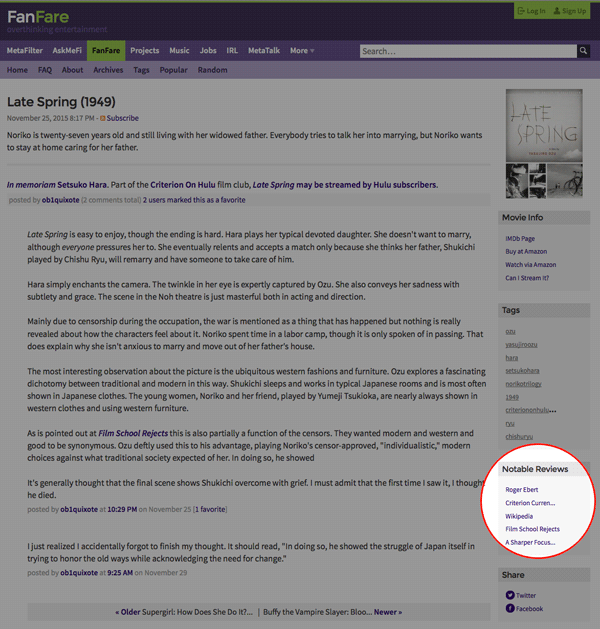 Here's another more typical example of Notable Reviews in action: the movie Late Spring. And here's a screenshot of the location of Notable Reviews in the sidebar. I think it's fine to point out the feature and encourage folks to use it. I also think it has some drawbacks that folks have pointed out here. We don't have any policy related to the feature. We built it to provide a place for people to collaborate on a list of good reviews. Maybe crosspost this to fanfare talk? I think this post could have worked at FanFare Talk but it also works here. I don't think it makes sense to split the conversation into two threads now that we're off and running here.